It was mid November when I last posted something about my baking..I made these rhubarb pies a couple of weeks ago and on my first baking adventure the pies vanished before I got my photo’s in. So today I baked and photographed all in one. 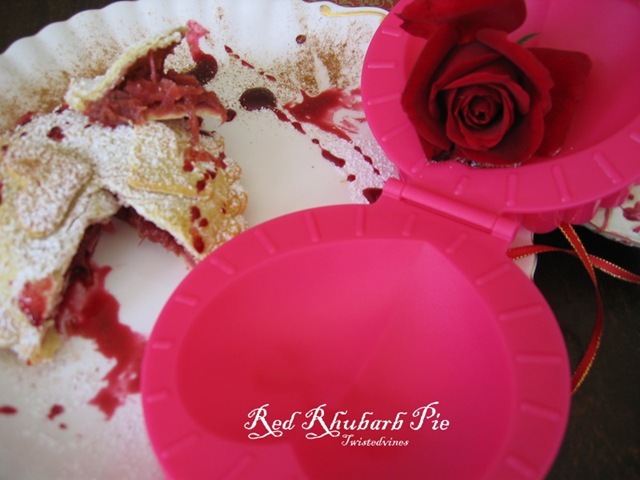 Didn’t want to miss out this time sharing with you this simple recipe…but more importantly showing you this wonderful pie mold I found. Believe me, your pies look perfect! 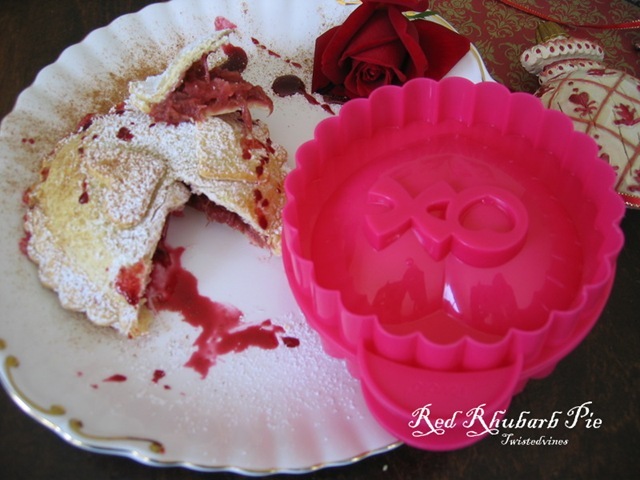 Isn’t it a beauty, take a look at what I found…It’s called a Petite Pie Mold. You can see details here. Preheat oven to 190° degrees. Take the frozen pastry sheet from freezer and leave at room temp. Cut roughly the rhubarb and granny smith apple, add a couple of drops of water, add the brown sugar and place on a medium heat until rhubarb has softened. Set aside for 20 minutes to cool. You can make out of one sheet, two perfect pies. Using the outside rim cut the round scalloped shape. Then place the scalloped pastry shape inside the mold on either side…mine is a heart shape inside, others are in the shape of an apple, star (funny how I bought that one..LOL!) Then fill the one half of the shape with filling, close the mold and press. There’s enough pastry just to do a simple shape decoration. A perfect pie! Thanks for recommending this, this is exactly what I need to make my pies look edible. Yours look delicious! 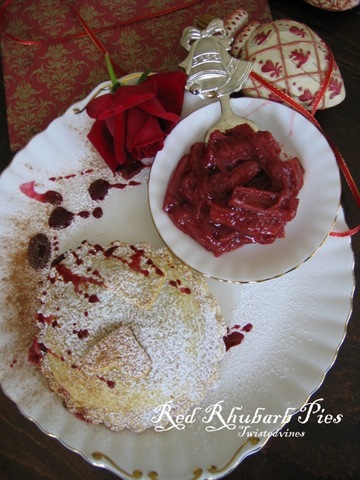 I am not a big rhubarb fan but wish I could find some so I can make it for my husband – he has never tasted rhubarb before. Your pies look absolutely exquisite Yvette and as always, so beautifully photographed. 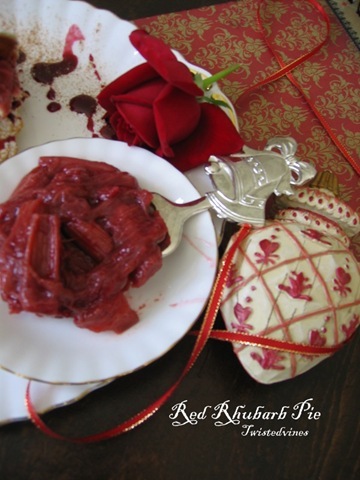 I love rhubarb and it is rhubarb season here so I am off to make a pie. Wonder if I can find a mould like that. Your presentation is delicious. Thank you for sharing. I have found different ideas for cooking rhubarb. One is, instead of using water and apples (the way I do it) some use lemonade which give it a sweeter taste. Another idea I have read is to cook the rhubarb with water then as soon as it is cooked stir jelly crystals into it to give it sweetness and it thickens it. One person said it was like jam. Not sure if this appeals or not. Hi Yvette, popped over to say thank you so much for your technical advice. Will have to give it a go! And now to your fabulous rhubarb pies..apart from looking stunning, I bet they taste amazing. I have a friend who grows rhubarb here in Andalucia. The locals can´t quite figure it out, but I love it! Very nice. Haven’t had a pie in years! The pies are looking so prettu and it sounds very taste! 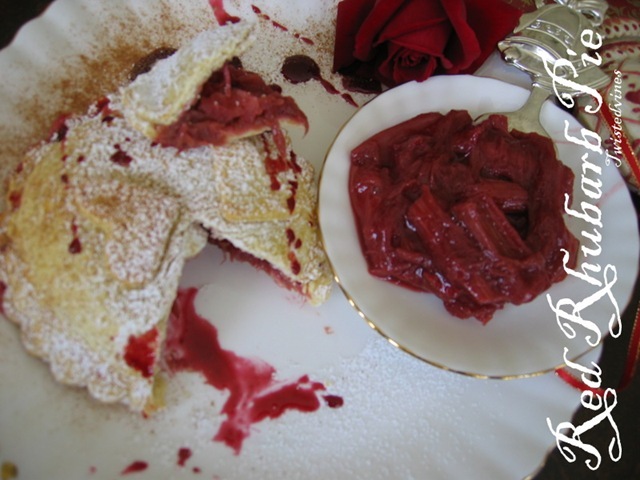 I have never cooked with rhubarb (Blush!!) Your pics are stunning, as always!! I’ve never bake with rhubarb before and your pie looks and sounds delicious. Guess I better get some rhubarb soon and try out your recipe. 🙂 Thank you so much for sharing. 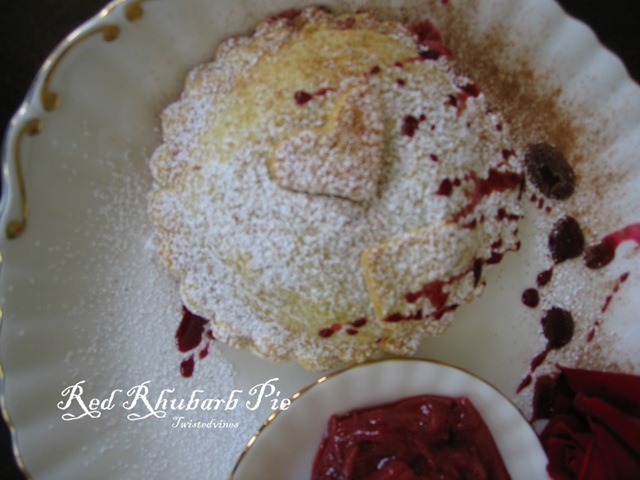 These little pies are so gorgeous and look so ultra flaky and deliciously tart with the scrumptious rhubarb. You really outdid yourself!